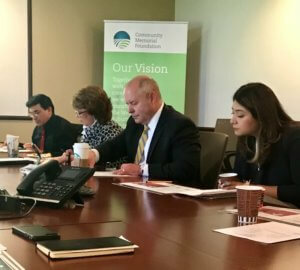 The Regional Health and Human Services‘ Implementation Council met on May 23rd for a progress report on two of the Agenda’s main priorities: Mental Health and Access to Health and Human Services. The Council is comprised of 16 individuals whose main responsibility is to oversee the implementation of various initiatives developed with the Agenda’s Action Teams in response to community-identified needs. Progress highlights include the development of an upcoming learning symposium on creating trauma-informed communities; a unique keyword partnership with Crisis Text Line to provide free crisis counseling via SMS text message; a partnership with Healthy Communities Foundation to pilot the community healthcare worker model in our region; and a partnership with the Illinois Coalition on Immigrant and Refugee Rights to provide immigrant healthcare access trainings in four Foundation communities. 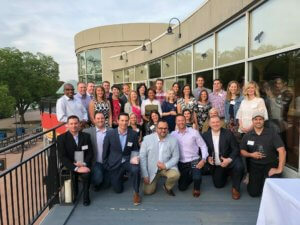 Beth Murin, CMF Communications Coordinator, was recently named one of the West Suburban Chamber of Commerce and Industry’s Regional 30 Under 40. The award recognizes young professionals who live or work in one of WSCCI’s nine communities and are “making a deep impact on our local region”. Beth joins our fellow grantee partners – Joy Bruniga from Pillars Community Health, Emily Goulding from AMITA Health, Bethany Mager from Nazareth Academy and Emily Mantucca from Helping Hand Center – in being named to this important network of community changemakers. Congrats, all!